A screen capture of Benetton's article, published by Lawyers Weekly. Imitation may be the sincerest form of flattery, but not when your work isn’t credited — or compensated. Earlier this month, freelance writer Luigi Benetton received a message from an editor who had come across one of his articles online. The only problem was that it was posted under someone else’s byline and it was on a site he’s never heard of, let alone heard from. The post matched, word for word and even the headline, an article Benetton had written for The Lawyers Weekly, a publication owned by LexisNexis. The article was published on a site called eBizDocs.com, a site based out of Menands, New York, that calls itself “an award-winning electronic document management service provider that is committed to helping companies, state agencies, local governments and other organizations find electronic solutions to otherwise inefficient record management systems.” It was attributed to “Benedict Dabrowski,” who appears to be an employee of the company and quite possibly a real person. His byline appears on various articles on the site, including press releases about the company’s charitable initiatives. Benetton notified the managing editor of The Lawyers Weekly, Tim Wilbur , who sought advice from in-house counsel at LexisNexis. Based on that advice, Wilbur wrote an email to the eBizDocs, demanding they take action, and threatening to get lawyers involved, if they didn’t. [Note to prospective plagiarizers: don’t steal work from an publication that has “lawyers” in its title and not expect to hear from some.] Less than an hour later, the article was gone from the site. Google’s caching function still picks it up, though (see screen capture). 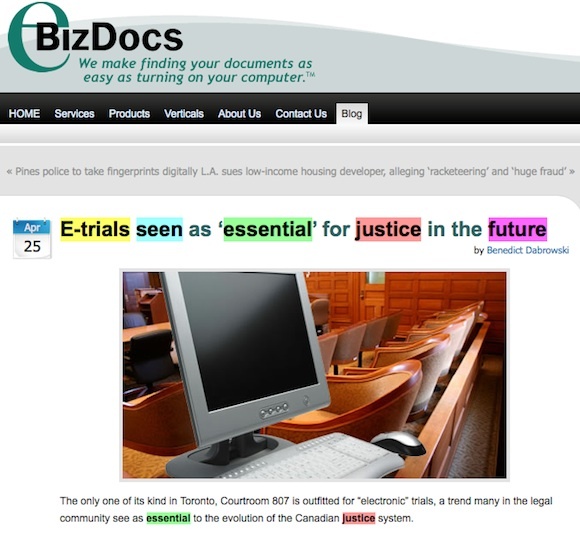 A screen capture of a cached version of the story originally published April 25 on eBizDocs.com. Benetton says no one from eBizDocs contacted to explain what happened or to offer an apology. Despite the fact that his work was posted on the site for weeks, without his knowledge or permission, he did not plan on seeking compensation from the site and said he wouldn’t know how to go about it. Are there really no consequences for plagiarizing other people’s work online? We contacted Benedict Dabrowski by email to ask how his byline ended up on the story. He did not respond. Has your work been plagiarized? How was the situation resolved? Do you know, or know of, anyone who has sued for damages and won? Please share your experiences in the comments below. While legal action may be expensive, it might be worth sending an invoice for unauthorized use. I’ve done that on the few occasions when I’ve found my work used without my permission. For unauthorized use, I charge three times the normal rate for usage rights and usually offer to license the work for an extended period (so that the infringing publisher has a chance to get the value paid for, through authorized use). So far, I have always received a cheque in the mail, but have never had anyone take me up on the license offer. Even if they don’t send payment, the effort on my part was minimal. Nothing ventured, nothing gained. That’s an *excellent* approach. It also puts the offending party on notice that people do keep track of this sort of thing. It’s worth Googling the headline, or a line or two, of your work from time to time. It can be useful in terms of finding out whether anyone is quoting your material – which may lead to more work! – or ripping you off. Quick update: as suggested, I invoiced eBizDocs, giving them 10 days to pay and a PayPal payment option via Freshbooks. The day AFTER I sent the invoice, counsel for eBizDocs contacted the editor at the Lawyers Weekly to see about setting things right. Today, they asked for (and the editor sent) the correction notice to be posted on the eBixDocs website. They’re also trying to ascertain whether I have copyright, likely to figure out whether I’m within my rights to invoice eBizDocs. Stay tuned on that one. Oh well… no reply and no money from eBizDocs. I doubt this is worth pursuing, so I’ll chalk it up to a company not wanting to do the right thing and pay a relatively minimal (3-figure) invoice for several weeks of unauthorized use and a blatant act of plagiarism. And I’ll move on. In case you’re wondering, I don’t believe in exacting a pound of flesh – you can’t take a pound of flesh to the bank. Sure, this case deals with online content, but this article’s tenets apply just as well. I doubt the plagiarizer in this case was worried about a lawsuit… and to avoid problems, all the plagiarizer had to do was take down the plagiarized post… which is what happened.